Why is it hanging in the air, mum? Observationsdate......: November 29th. 1973. Time: 04:12 p.m. Eye witness...............: More than 4. "I was in kitchen, when my daughter came and asked; "mother, why is there a large stick hanging in the air? Why is it doing that?" "I followed her to the living room and saw out the window, and for sure it looked like a stick, on a slant over neighbors rooftop. 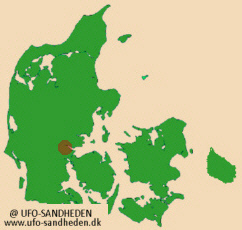 We gradually became aware that the object had to be far up, very big, and very far away", says a woman from Boegeskov near Fredericia. Her daughter and two friends had been drinking coffee in the daughters room, when one of the girls looked out the windows and said: " what's that stick?" The three girls looked at the floating thing for a while and started to wonder. The girl went to her mother. The point of time were 04.12 p.m., November the 29th. 1973, the sun had gone down, however the sky in west, where the object stood, had a nice orange color. It was below zero and very clear air. From the room the witnesses saw, that 'the stick" was making a single line of light up diagonally and then started to move very slowly in relationships to the next door rooftop. The course were due west. When is was gone behind the rooftop they went back to the living room and saw in for a few seconds before it dissapeared. They then knew that it had to be high up in the sky and far away. Its course sent it past the house once again. When they had looked at it for a long time, the mother went back the kitchen and the girls back into the daughters room. Shortly after the mother went back to the living room, and saw "thee stick" as a little tiny dot, and then is disappeared into the horizon. She estimating that the observation lasted about 20 minutes, and that the object, when she first saw it, were approximately thirteen mm. the destination between thumb - and index finger with the arm outstretched. That may not sound of much, but try to measure a book that is five meters away in the same way. The actual size of the object all depends from, where far away it was. After making a report and being introduced to various portraits of flying objects. the witnesses believed that it most of all resembled George Adamski's portraits of "motherships"
Professor George Adamski claims, that these long, cigars shaped vessels, are motherships for the small "flying saucers". The woman that approached the UFO-group says further more: "I wrote down the time, place, direction and the size of the object, but did not know where to go with the information. I thought of calling a air force base, but did not want to make a fool out of my self. If I didn´t happen to read the newspaper 'Elbo Bladet' article about the strange traces on Oesterstrand, I would have but the information's in a drawer and that would have annoyed me, and then they would have ended up in the recycle bin.